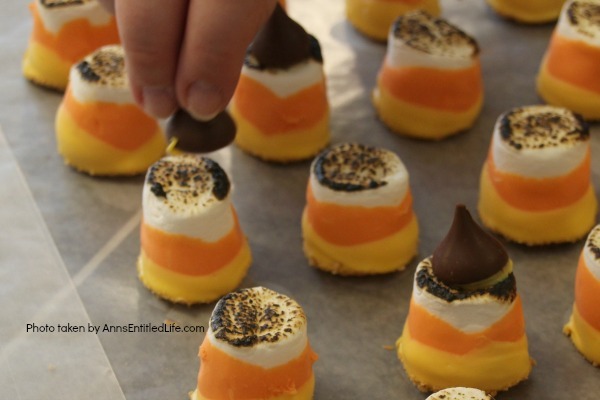 These are one of the easiest treats you can make. You do not need a campfire to get the great taste of S’mores. 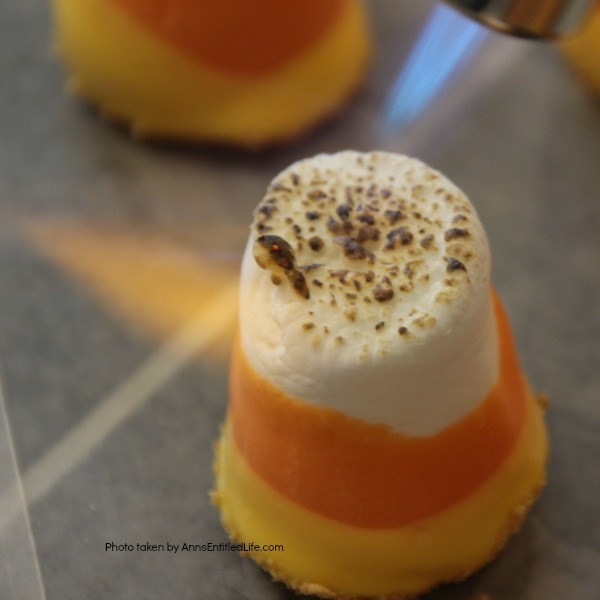 Make these delicious candy corn S’mores in your kitchen in about 10 minutes. 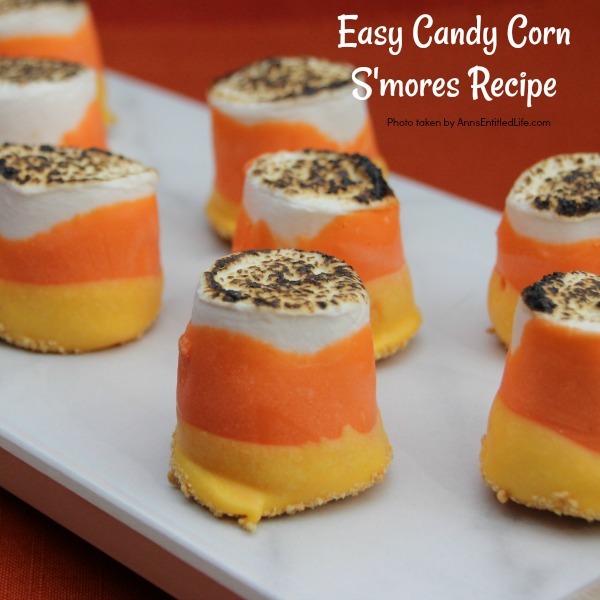 Great for parties and snacks, these cute little candy corn s’mores are a simple sweet treat adults and children will love! • These are whole marshmallows. They will burn quickly. Pay attention when you brûlée as you will probably need to blow out a fire. • If you are not sure how fast the candy melts in your local grocery store turnover, buy some Wilton chocolates. They are a great consistency and generally easier to work with. • You do not have to purchase colored chocolate melts. You can buy white chocolate and color the chocolate with coloring. • When working with chocolate, try and dip the darker color first, then a lighter color. 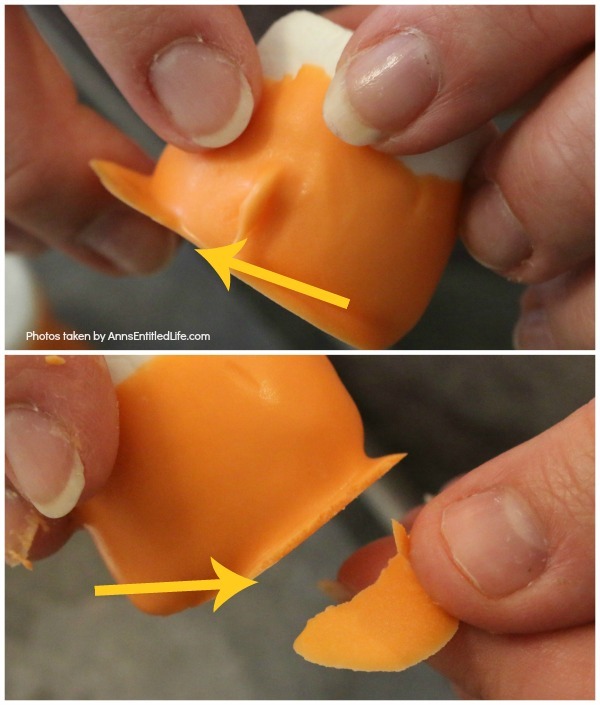 • If you have too much chocolate from your orange base and it forms a puddle, no worries. Allow it to dry and break off the overflow. No one will notice as you are dipping in yellow chocolate which will cover it. 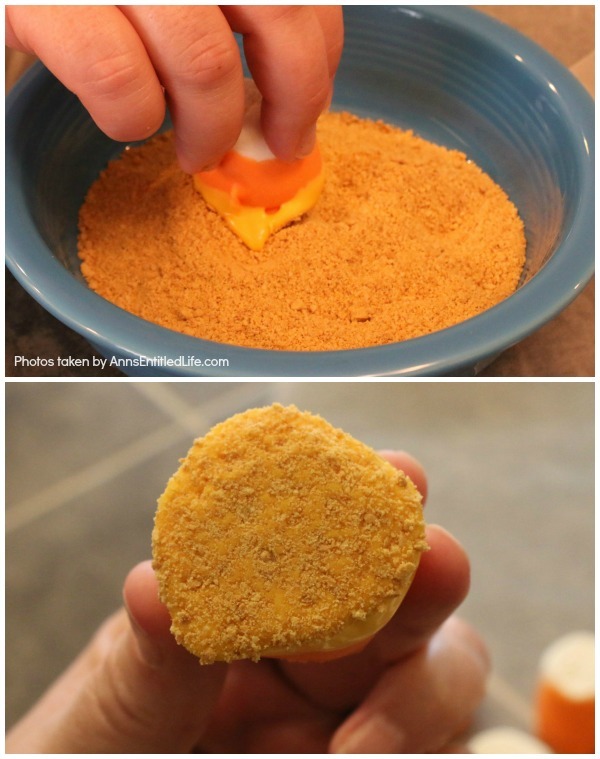 • You can dip in your Graham cracker crumbs higher. We (my niece and I) decided only to dip the bottom of the chocolate covered marshmallow as we wanted to the yellow chocolate to show. • We chose a smaller marshmallow for this treat. 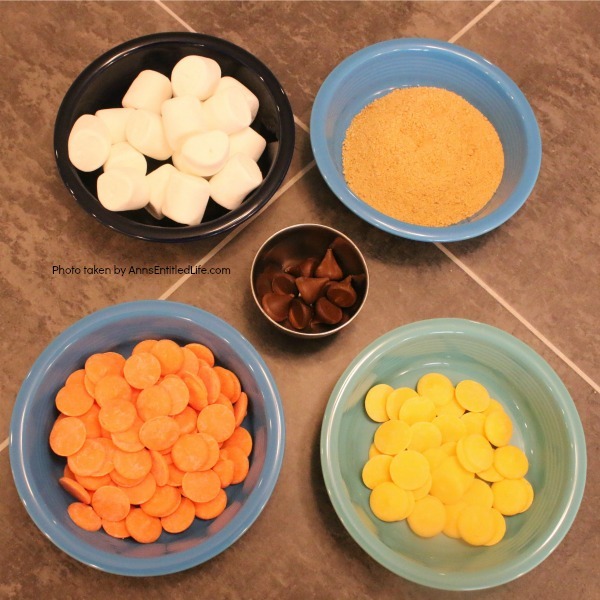 Next week you will see the Halloween s’mores we made with jumbo marshmallows. You can use jumbo marshmallows, but the larger the marshmallow, the more difficult it is to work with. However, the jumbo marshmallows are impressive when s’more-d.
• You can use a fork inserted into the marshmallow to dip in chocolate or your fingers. • Remember to allow the chocolate to dry, so you do not make finger prints in the chocolate. • These are so stinking cute it isn’t funny. These photos truly do not do them justice. Make them; you will be glad you did! • Place a piece of waxed paper down near your work area. • Place Graham cracker crumbs in a bowl. Set aside. 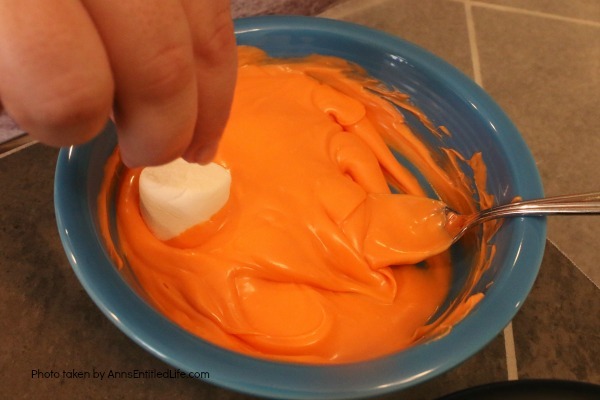 • Place a cup of orange chocolate melts into a bowl. Heat in the microwave for 30 seconds, stir. Heat in microwave for another 30 seconds; stir. Repeat a third time. Check the consistency of your chocolate. If smooth, do not heat further. If it still does not stir and drips smoothly heat one more time. • Place a marshmallow on a fork. 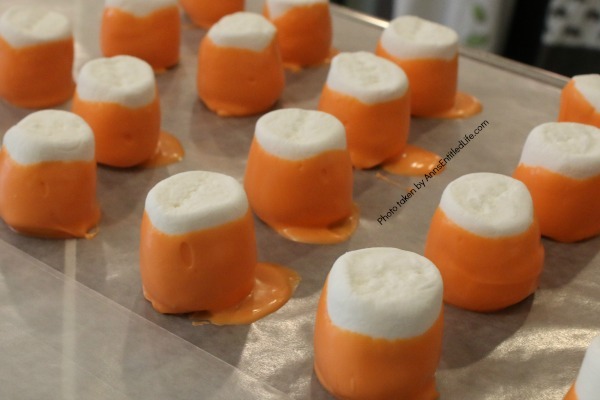 • Dip the marshmallow into the orange colored chocolate one-half to two-thirds the way up the marshmallow. • Place on wax paper. Allow to dry. 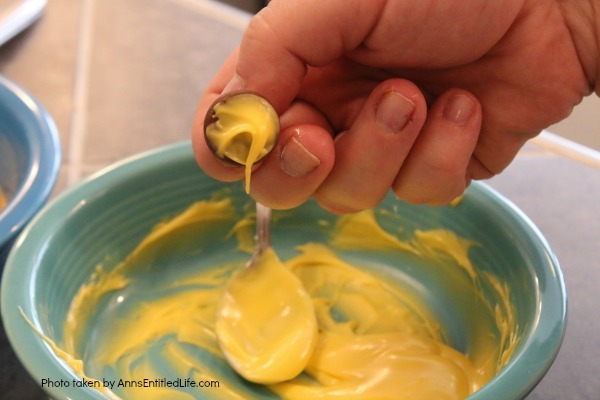 • Place a cup of yellow chocolate melts into a bowl. Heat in the microwave for 30 seconds, stir. Heat in microwave for another 30 seconds; stir. Repeat a third time. Check the consistency of your chocolate. If smooth, do not heat further. If it still does not stir and drips smoothly heat one more time. 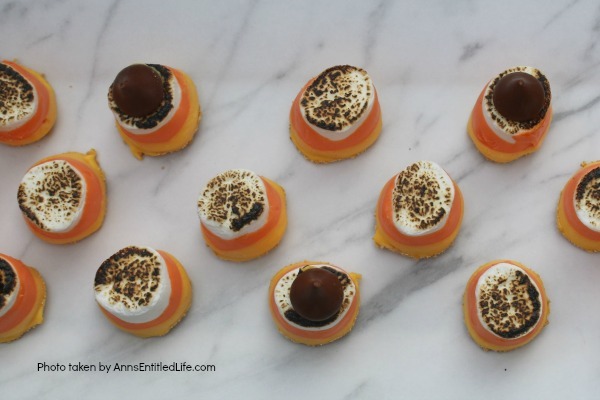 • Place a chocolate orange covered marshmallow on a fork. If any excess puddles of chocolate dried at the base of the marshmallow, pinch them off. 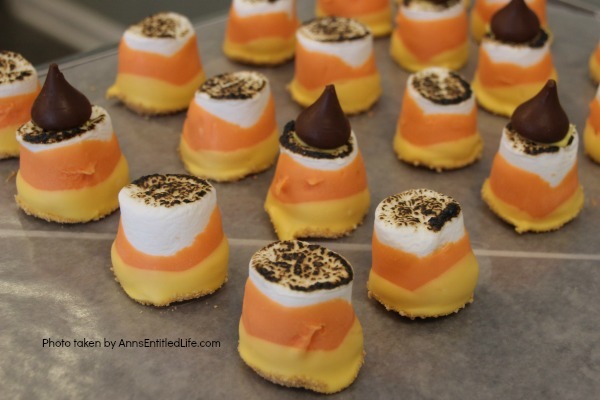 • Place the chocolate orange covered marshmallow into the yellow colored chocolate. Dip approximately one-third to one-half the way up the orange chocolate. 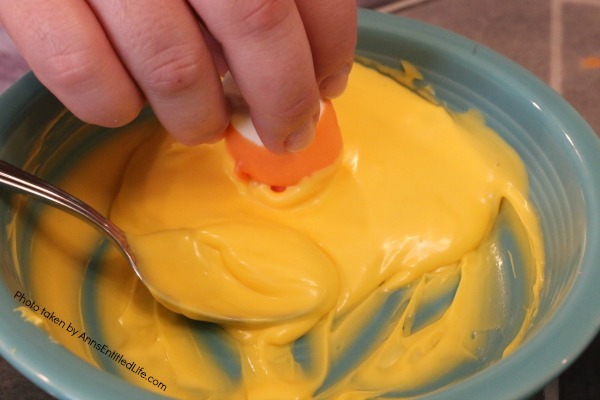 • Immediately dip the wet yellow chocolate covered bottom of the marshmallow into the Graham crackers. • Set on wax paper to dry. • Fire up your culinary torch. • Quickly brûlée the top of your marshmallow. Try not to light them on fire! (Always use caution when working with an open flame.) If you do, blow out the flame immediately. 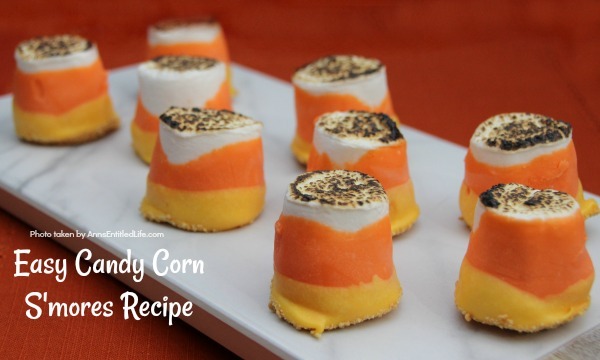 • If you are adding Hershey kisses tops to the candy corn s’mores, now is the time. 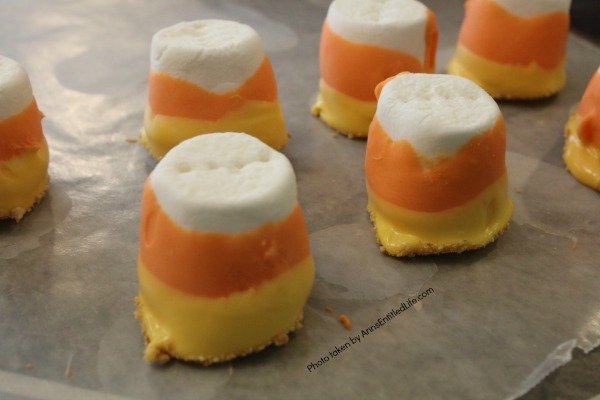 Dip the bottom of the Hershey kiss into melted chocolate, place on top of a candy corn s’more. 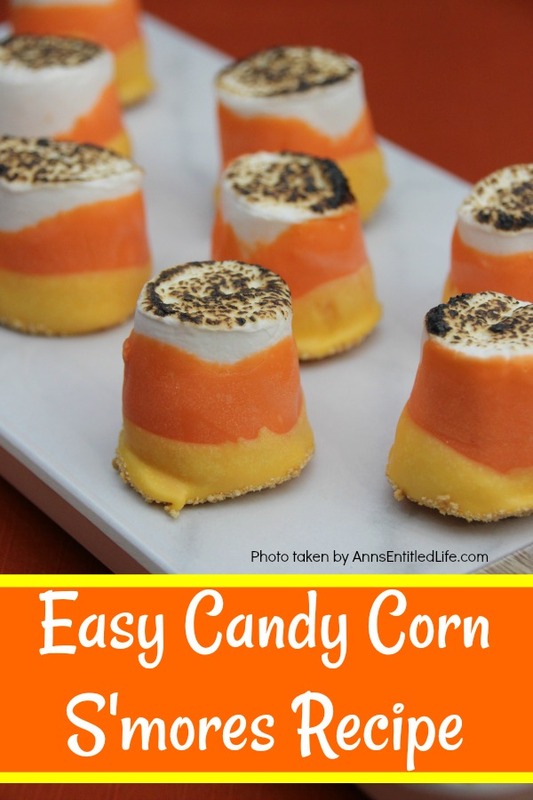 • Allow candy corn s’mores to dry completely.